Here's my entry. Took me 7 minutes of my life. Oh, well. I got life to spare. I just thought the dark circles under the eyes fit. I was thinking of Doofenshmirtz at the time, so that's how. I didn't know if you wanted your name on there or not, but I put it there anyway in orange since you use orange all the time. Quick tip, people: When you're doing the outline of my head, something bigger than 1pt is generally a good idea. Also, I know most of you don't have tablets, but seeing a perfect circle for my head is kinda off-putting for me. Sorry that I made mine a perfect circle Roy but I could not get that head shape I had in mind. I can't exactly draw what I imagine (actually I can't get anywhere to what I imagine) because my hand gets shakey when handling a pencil, pen, marker, crayon, hermit crab (not for drawing or coloring my hand just shakes a lot when I hold 1), & computer mouse. I don't know why my hand shakes it just does. So unless you want a very bumpy head I had to use a tool to make a circle. Ok about puting Roy's name in I did not include his username here but I happen to know what his username on youtube is. Yes I actually did watch the videos that Roy has about this place. Although I have to be honest I found it hard to pay attention to them because I liked Roy's voice so much oh uh wait I'm going off topic lets get back to talking about drawing Roy. We were on the topic on how Roy looks not what he sounds like. Don't worry; when complimenting me, there's no off topic. But anyway, even when using the circle tool, having it be a perfect circle really just adds to the Uncanny Valley feel, so even just having an oval that's very close to a circle would have felt better to me. I'll be honest, I didn't exactly intend for it to be a perfect circle. But hey, I just now noticed it. And I agree with Dr. Coconut- I watched/listened to your PaF Community videos cause I really wanted to hear your voice. I was busy listening to it the 1st time to pay attention. Since I'm considering trying animated shorts, I drew this as the main character; me as a teenager. I generally don't care how much offence each of you take towards it, but I will likely use it as my avatar instead of any of yours. Yes, I'm aware of the hands and feet. You're pretty good at the body and clothes. I noticed how you use the same type of head and facial features for examples and such. I actually tried an alternate method of drawing it than the really stupid method I usually go with. For one thing, it was in Photoshop, so I had the freedom of putting the shirt, jacket, head, jeans and hands/feet in separate layers. Second, rather than what I would usually do, which never really worked out, I just did the classic shapes method on the bottom layer, then drew the clothes on top of them. 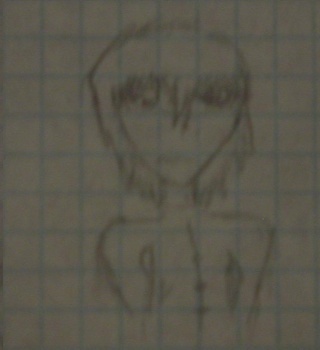 I know it's pretty bad but it was just a sketch AND my first time trying to draw a "complete" male manga... thing. I apologize if this at all offended you, which it likely did. Anyhow, feel free to tell me it sucked, because it did. And as in answer to the topic's title which so happened to be a question...: No, no I'm not. Yep; it's pretty bad, and I don't think seeing the image in full focus would make much difference. I guess you'll just go with the one you drew, eh? You know, I actually will take offence from that one; not the quality, but how you depict me. Also how old you depict me as, but I suppose that's not super importan-could people stop using plain white backgrounds?! What program will you be using for said animated shorts? Also, will they include sound and voice as well? Sorry, I'm just interested in that sort of thing. Either Flash, or, with hopeful preference, After Effects. Do you want to try your hand at what you imagine I'd look like, Achidanza? I've never used After Effects, but it seems really neat. Sort of like a fusion of Flash and Maya. Aww man, I'm no good at things like that. I'd be too paranoid that I'd screw it up. Not really a fusion of those two; it's for post-processing. It can't create true 3D, but can work 2D objects in 3D space. You can do incredible things using After Effects on its own, but it's not just an animator like Flash. Much like how Mac programs are all designed so you use them and not third party software, Adobe's programs work best and just click when you're using all of them for something. I liked a recent tutorial I watched for AE, with which I now can replicate the effect from Jumper. Complete copy of my Twitter post: "So I've officially taken the South Park interest a little too far now. Chibi me! Might use that in an animation at some point…"
Whaddaya think? Imagine that for Roy in "Because It's Fun" as well, if you want.